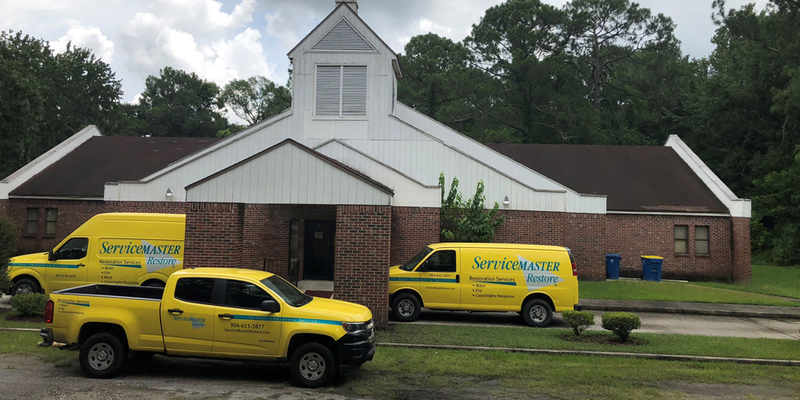 When disaster strikes your business, let the professionals at Service Master Restoration by PWF get you back into business as quickly as possible. Our commercial cleaning services are the final step in that process. Whether you need top to bottom cleaning or just little freshening up, we can get your business back to business. The building materials in commercial and industrial buildings are not the same as home construction. In commercial buildings, from the steel framing and the coarser, more porous wall construction to the acoustical ceiling tiles, the building materials require different cleansers and techniques to finish the restoration process. Ceilings are a catch all for everything that is in the air in your business. Whether you have smoke or fire damage, or water damage, chances are your ceiling tiles are going to show them. They are also a breeding ground for mold, mildew, and bacteria. Having ServiceMaster Restoration by PWF clean your ceiling tiles you can not only improve the visual appeal of your building, but you can also improve the health factor of your building. Walls can become dirty over time, even without any kind of disaster. Whether your business has soot, water damage, or just handprints, let us use our expertise and restore your walls to their beauty without the expense of having to completely repaint your building. Many office buildings use vinyl wall coverings rather than the traditional paint or wallpaper used at home, so the same techniques you use to clean your walls at home will not work on these walls. Upholstery and fabric cleaning in the business setting is often an overwhelming thought. The sheer amount of fabric and upholstery in most office buildings is crazy. The fabrics and textures are harder and more complex than those of the home, so cleaning them requires different chemicals and techniques. HVAC cleaning is one of the most important post disaster follow ups that a business owner can do to help their building. Whether it is fire or water damage, chances are good that it has affected your HVAC system or ductwork in some way. Cleaning your system will ensure that your employees will return to a safe and healthy building. Not to mention, chances are that your building will smell better after the ductwork is cleaned. Whether you have industrial carpeting, hardwood, or tiles, the final step in disaster cleaning. Once the rest of the building is cleaned, your floor will need a thorough cleaning. Service Master Restoration by PWF has the right technique for every flooring. We are aware of your time constraints, so our technicians can work around your hours.